The fireplace mantel comes in two major parts: the lower mantel and the optional overmantel. 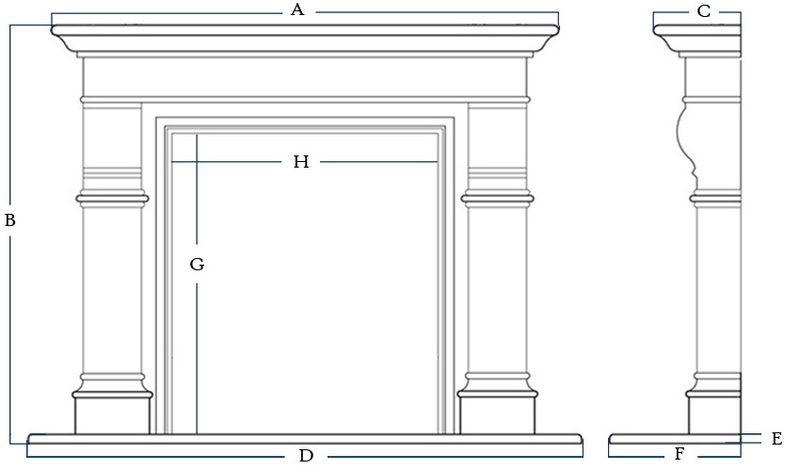 The main parts of a lower mantel include the shelf, legs, header, inner trim, and hearth. The main parts of the overmantel are crown and wall cladding tiles. The shelf depth can be sized to your desire depending on the size of your room. Some of our customers like to decorate on the shelf and prefer a shelf depth of 12″. All parts of the fireplace mantel are sized to proportionally accomodate your firebox size. If you have a design you would like us to make, you can submit it for pricing on our quote page. 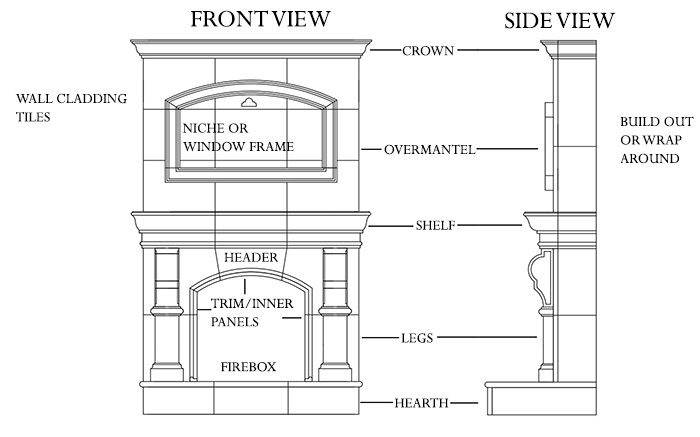 Standard overmantels sizes start at 8′ ceilings and go up. Whether you have a flat wall or built out that you want wrapped, we can match the lower mantel and overmantel to fit in both cast stone and natural stone. Hearths are available seamless or in three parts. There are a variety of hearth edges available and can be paired with any of our fireplace models. The standard size for a fireplace hearth is 1.5″H. Raised hearths are available and can be custom sized to accomodated the height of the firebox from the floor. There are a variety of customizable features such as a raised hearth, wrap around, decorative medallions, keystones and window frames.